Promotes protection against damage caused by environmental noise. ¤ The latest research shows that 16% of adults and a third of those over 60 suffer from auditive loss of 25 decibels or more: at this level of hearing impairment, a hearing aid is generally recommended. Our ears face a number of assaults': the noise pollution' which surrounds us, shocks (including repetitive micro-trauma during sporting activities), free radicals, atherosclerosis and circulatory disorders. Fortunately, certain nutritional supplements and phyto-nutrients can protect auditive function, stop or slow down loss of hearing associated with ageing and even help to partially restore lost capacity. 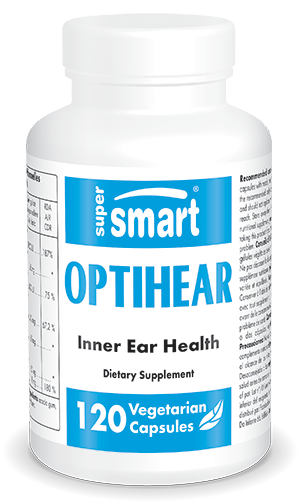 OptiHear™ is one of the first formulations specifically designed to protect and improve hearing. > Vinpocetine (an alkaloid extracted from the periwinkle) is particularly effective in auditive loss of sensorineural origin involving the inner ear (cochlea) and/or degeneration of the auditive nerve. Several studies show a significant improvement in hearing (from 10 to 40 decibels) following daily supplementation with 15 to 35 mg of vinpocetine. In the case of Menière's disease (dizziness accompanied by tinnitus), vinpocetine was shown to be superior to other vasodilators. In animal studies, vinpocetine provided protection to the cochlea against powerful ototoxic agents (toxic to the inner ear) for a period of 14 consecutive days. > Vitamin D deficiency increases the risk of cochlea disorders and supplementation is therefore recommended. A study carried out at the Semmelweis University of Medicine in Budapest (Hungary) showed that certain bioflavonoids, including quercetin, protect collagen from degeneration and so decrease sclerotic lesions that can affect the ossicles of the inner ear. > According to a study involving 300 healthy young soldiers, daily administration of 167 mg of magnesium (in aspartate form) effectively protected them from damage caused by environmental noise. > And in a study of 350 patients, 70 days of treatment with Ginkgo Biloba extract completely eradicated tinnitus (buzzing in the ears) in 35% of those affected. A significant improvement was seen in 82% of patients.